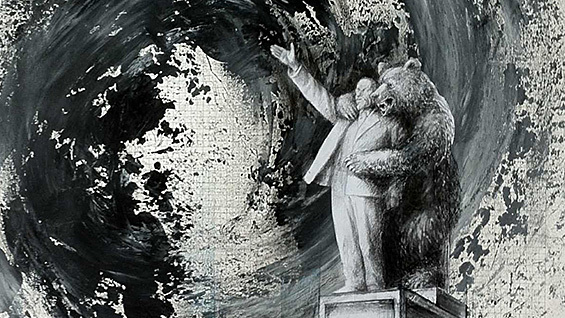 In a free, public lecture Vitaly Komar speaks about the changes his work has undergone in Russia and in the West and how the Soviet authorities destroyed an exhibition of works by underground artists, such as himself. Vitaly Komar was born in 1943 in Moscow (U.S.S.R.) and was one of the founders of Sots-Art, a Soviet version of conceptual Pop Art, which reflected images of totalitarian propaganda. From the 1970s onward he has woven together ideas and images in a process of “conceptual eclecticism.” He showed at the 1974 “Bulldozer Exhibition,” in which Soviet authorities destroyed his work as well as works of other underground artists. Since 1978 he has lived and worked in New York. In 1982 he received a grant from the National Endowment for the Arts. From 1972 to 2003 he collaborated with Alex Melamid, as well as with the Fluxus musician Charlottle Moorman (1976), Pop Artist Andy Warhol (1979-80), painter Renee the Elephant (1995), photographer Mikki the Chimpanzee (1998) and the with the masses via polling company (People’s Choice). Vitaly Komar appears as part of the Interdisciplinary Seminar, created as a discussion series on artistic practice for the students of the Cooper Union School of Art and the creative community that surrounds them. Lectures are free and open to the public.